We offer first aid kits packaged in plastic cases or nylon zipper bags that can be custom imprinted with your company logo. 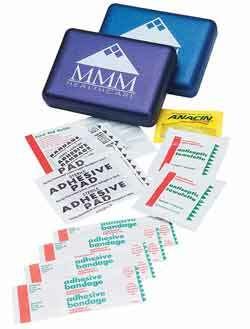 We carry the widest selection of first aid kits, from small inexpensive kits to fully stocked professional models. We also offer custom printed bandages, bandage dispensors, and many related safety and medical related products with customization.